Gap Year In Ghost Town was absolutely hilarious, endearing, and (surprise) full of ghosts. I really really like ghost stories and can never find enough. Like what’s more fun than starting off with half your cast dead?!? I know right?! Epic. But the real reason this book won me over was: it’s downright hilarious. Anton is an absolute talkative, adorakble, stupid, and heartwarming bucket of SASS. As much as I like a dark YA hero, I am so here for the talkative and happy ones. We need them! But seriously…ghosts and humour? It’s made for me. DID I MENTION GHOSTS? Basically Anton and his dad own a small-home-owned ghost hunting business! But instead of killing ghosts, they put them at rest and send them calmly into the next life. These are chill Hufflepuff ghost hunting lads and I loved them. THE PLOT INCLUDES A TON OF WILD ACTION. Because ghosts know very little chill ghosts, which is Reason #848 I probably am actually a ghost. They’re so relatable?? But anyway. There are Secret Bad Organisations™ and ghosts trying to eat your liver and organised ghost crime. Plus — THEY FIGHT WITH SWORDS. We need more swords in modern literature. I want a sword. I feel validated reading this book. ANTON IS SO FREAKING FUNNY. The sheer amount of wit, snappy comebacks, and hilarious banter gave me life. At first I thought Anton might be a little tacky, but pffft, nooooo. He was charming and endearing and totally stupid. I love him. A platonic girl/boy friendship. Bec and Anton are BFF with 0% romantic feelings. I REALLY LOVED RANI TOO! She’s a ghost hunter from London who kind of believes in KILL ALL THE THINGS while Anton is trying to sing kumbaya here. She has a sword, okay? A sword!!!!! She’s also Chinese/Malaysian/British and has 0% time for your shenanigans. THERE’S EVEN A LOT OF BOOK APPRECIATION. Anton and his dad run a bookshop between killing ghosts. He always takes a book with him (even on deathly missions) so basically was ever a book boy so perfect. I have a phone charger, my pro standard GPS unit, a water bottle, a book and an e-reader just in case I finish my book. Can’t be without a book. DID I MENTION IT WAS SO HILARIOUS. Because that is what gives me life. IT LEFT ME WITH A TON OF QUESTIONS. Which means I desperately want a sequel because there’s so much depth to this world and these ghost-hunting people. It felt like Supernatural, but in book form! 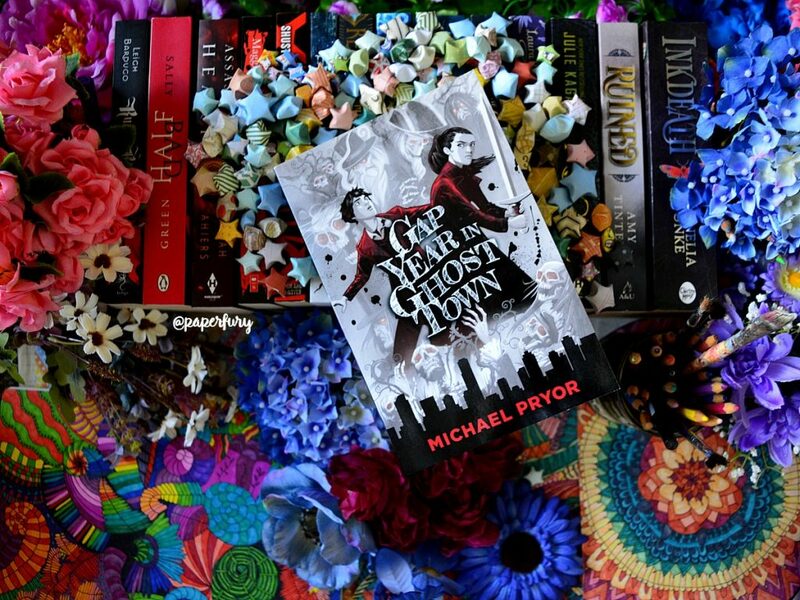 And heck yes, I love books revolving around ghosts and the paranormal world! I ADMIT…I FELT THE STAKES WERE A BIT LOW. They didn’t seem written to be low, but I just felt none of the action scenes escalated to “ooh this is scary” levels. It was just a bit comfortable. I’m not saying all books should be uber dark (ALTHOUGH I WISH) I just wanted to be scared of the ghosts?? It also made the finale a bit easy. AND AS MUCH AS I ADORED ANTON, I THINK HIS FLIPPANT TONE MADE IT HARD FOR THE BOOK TO GO DEEPER EMOTIONALLY. It’s not impossible. The Gentleman’s Guide to Vice and Virtue has a similar tone with a sassy/flippant narrator, but it packs an emotional punch too. So I just wanted more feels! Anton turned every scene into a joke…and not complaining because I’m laughing but yet???? I wanted more depth. AND HONESTLY I THINK THE CHARACTERS’ AGES WERE ALL WRONG. 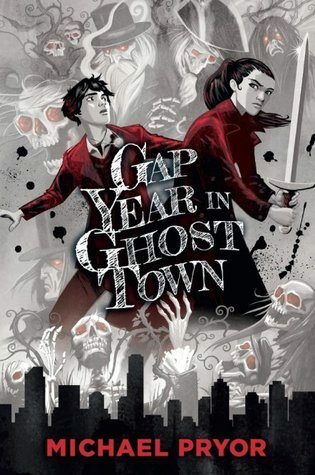 Obviously it’s a “Gap Year” in ghost tow….aka, the characters have finished high school and are 18. But the tone and style was more like younger YA. I would say 12+ would love this. Not to say younger kids can’t read about older kids, but I just felt the target audience was a bit of a mess. Plus Anton felt more 15 than 18. This was such a pleasant, fun and ghostly surprise! I thoroughly enjoyed myself and I adore Anton and PLEASE LET HIM NEVER CHANGE. He’s a dork and totally endearing. It focuses on friendship and family and SWORDS (!!!) and fighting ghosts and conspiracy theories. And can we appreciate the fantastic cover art for a second?!? Because I have much love. THANK YOU TO ALLEN & UNWIN AUSTRALIA FOR THE REVIEW-COPY. 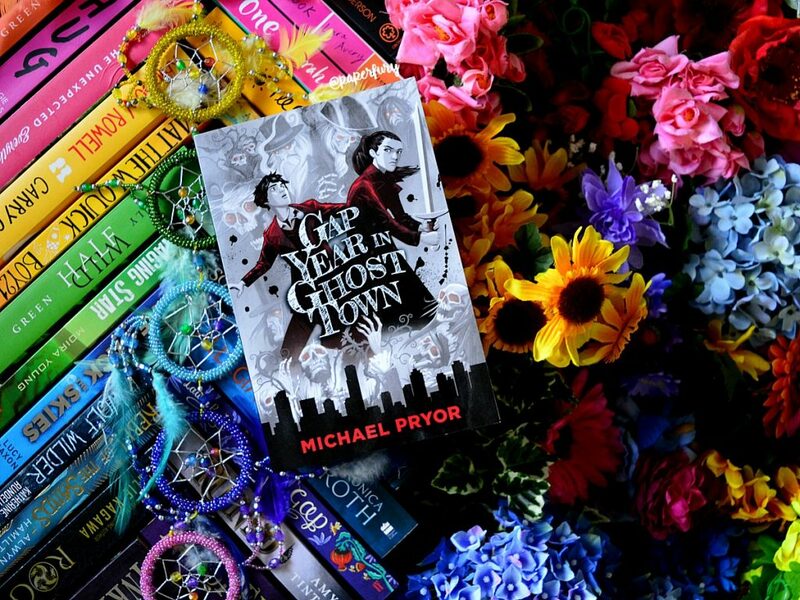 Gap Year In Ghost Town by Michael Pryor was published August, 2017.
do you prefer dark/tortured heroes or sassy/hilarious ones??? tell me about a book with a totally hilarious narrator? and HAVE YOU READ THIS ONE? because you should. Sounds good! And as for the book, two words. Hook’s Revenge. Because I FREAKING LOVE THE NARRATOR. I need to look that one up clearly! i LOVE sassy hilarious narrators, especially if it’s a bit of a spooky story because it makes it a bit lighter. I haven’t read this book but I’ll look out for it. A books with a hilarious narrator? Percy Jackson. definetly. there isn’t really a narrator in Skulldugery Pleasant by Derek Landy but it’s still hilarious!!! Have you read the Lockwood & co series by Johnathon Stroud? there’s also ghosts and swords and cake. It’s the only creepy books I enjoy!!! Percy Jackson is a FABULOUSLY sassy narrator! This does have a similar voice to Percy so like…insta love.😂 And I have heard of the Lockwood & Co series but not read them yet. I neeeeeed to. OMG… *DEEP BREATH* Ever since I read the word “TIM TAM” all I’ve been thinking about is Tim Tams. UGH ITS BEEN 11 YEARS SINCE I HAD A PROPER TIM TAM OR LAMINGTON. WHAT, WUT. This book seems fabulous, the sass seems straight up my street and Anton seems like a huge cute=y sass ghost killing ball URGH I’ll have to add it to my tbr. DEFINITELY ADD IT. YOUR TBR IS WELCOME. My TBR THANKS YOU DEARLY. I’ve only seen one other review for this book (I forget where though….) but the reviewer found it to be very funny as well! I love the idea of having Supernatural in book form (especially if it is more like the earlier episodes… which are my favorite). Anton sounds super entertaining, and hopefully if I read it I will be able to look past the fact that he sounds a little young. I usually find sarcastic and witty MC’s to be pretty entertaining (or really annoying… there’s a fine line in there), so hopefully I will love Anton too! I also really like the fact that the author is writing about his hometown. It really gets on my nerves when foreign authors try to place their characters in a city or country they obviously don’t know much about (which is one of the things that annoyed me SO MUCH about The Love Interest). I can’t wait to get my hands on a copy of this and read it for myself! I miss the earlier episodes of Supernatural too.😂 (Trying not to take it to personally that they’ve RUINED SEASON 12 OMGGG. *rants quietly to the moon*) Anyway. Back to the book. :’) It is super entertaining and I totally get you with that “fine line” between entertaining and annoying.😂At first I thought Anton was going to be a bit tacky, but I just ended up being fully in love with the story! UM, how have I never heard of this book before!? It sounds so, so good! I mean, my current TBR pile is cursing you, but I’ll definitely be picking it up (eventually.) I literally cannot remember what the last ghost-y book I read was! I definitely adore sassy hero/heroines. In fact, the more sass, the better! (As long as it suits the tone of the book!) My sci fi WIP has a superrrr sassy/arrogant MC and GOSH was that fun to write. YOU MEAN YOUR CURRENT TBR LOVES ME. *twirls happily* 😂 Tbh I haven’t heard much about it either yet? Which is ridiculous because it is a thing of glory. And sassy/happy narrators are in short supply and I want more of them. I LOVE me some sass in my MCs, and hilarity is a must. I also really like how you’re saying there’s actually a platonic relationship for once? It’s crazy because there’s SO MANY of these IRL but not in books and why? IDK. I am looking forward to this one, though. I KNOW RIGHT?! So beautiful and refreshing to have more platonic friendships in books! The whole book just ticks SO many boxes of awesome! Ghosts and no romance? YES! SO MANY GOOD THINGS I CAN’T EVEN. I’ve seen it on goodreads but I wasn’t sure. Again. you managed to add books to my list and my waller cries and cries. YOU AND YOUR WALLET ARE MOST WELCOME. *flails majestically and runs away screaming* But you should totally read something set in Australia soon!! We have a most glorious country. :’) And like agreed: where are all our ghost books at?!? NEED. AHH THIS SOUNDS AMAZING! I love SPN so I’m always on the lookout for ghost/hunters stories, but Anna Dressed in Blood really dissapoint me 🙁 This one sounds fun and totally amazing, I can’t wait to read it! I’ve been recommended that so many times now I REALLY have to get to it!! That’s a difficult question, but I think I would have to go with sassy/hilarious. My favorite heroine is Charley Davidson in Grave series by Darynda Jones. Even re-reading those books, I always crack up laughing. Like wake-my-husband-up-in-the-middle-of-the-night-from-howling-laughter, laughter. She’s quirky and super sarcastic and I’m still in love with her 12 books in. OMGGGG THAT’S INSANE. 😳😳😳 Can you request your library get it maybe? i think i’m just here for the supernatural gifs at this point. i’m torn because i love mah dark heroes but aLSO the sassy ones give me life. so. if i had to choose, it would the ones that use sass to cover up their darkness. so basically both. I love the title in this book! And also the new flowers are ON POINT! <3 I don't know what to answer to your question… sassy/hilarious characters are my FAVORITE and I love them so much, but also, who doesn't love dark, tortured souls? Moody, mysterious characters are also amazing. I really cannot choose! The title is SO fabulous! I’m just loving so much about this book.😂 And like I do like the dark/tortured souls too, omg they are precious tragic cinnamons. BUT it is nice to have someone who’s a little more happier sometimes, I agree! WE NEED BOTH. This book sounds awesome! I’m definitely adding it to my tbr! I love sassy and quick witted characters. Love them! Have you tried Trouble is a Friend of Mine by Stephanie Tromly? It’s a trilogy. There is some romance but the characters are so much like Sherlock and Watson (Watson’s a girl though!!) with all the quick sassy comebacks. There are mysteries and Digby (that’s Sherlock!) drags Zoe (Watson) into a lot of trouble. It’s actually quite hilarious. It was one of the first books I got in an Owlcrate box. I really want to read that one! I have it added! I’ve been seeing this book EVERYWHERE. 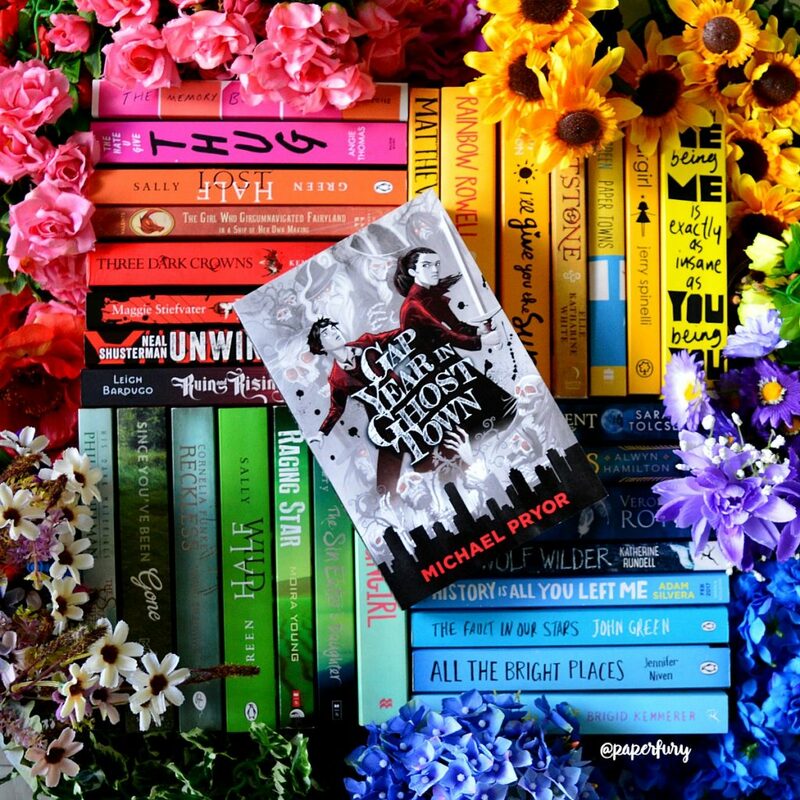 I kind of love that it’s about teens out of high school, but a shame that they still felt too young 🙁 I really want more 18/19 year old protagonists in YA because they are still teenagers! And learning! And growing! And going through teenagery stuff. I much prefer dark and tortured heroes. They are lovable. And I feel more protective love towards them? I LOVE THEM, OKAY. I was worried this’d be cringey, but IT WASN’T! CAIT! You had me at “heartwarming bucket of SASS.” Seriously. I didn’t even finish reading your review because I NEED TO MEET ANTON. I just know. Plus, yes coffee love and Tim Tam and #AussieAuthorRepresent! Totally sold, is basically what I’m saying! Will be on the look out for this book here in the Philippines. OMG THIS MAKES MY DAY!! I’m always so pleased to convince someone to read a good book.😂😂And SO much Aussie author appreciation!! I really hope you can find it! DUDE. You had me at coffee. *aggressively needs this book* I JUST STALKED THE INTERNET AND THEY DON’T HAVE IT AT MY LIBRARY AND THEY DON’T HAVE IT WHERE I CAN BUY IT WITHIN A SANE PRICE RANGE AND NOW I’M SAD 🙁 I’ll read it one day though. IT’S AT THE TOP OF MY WISH LIST. CAUSE COFFEE. DEFINITELY READING THIS. 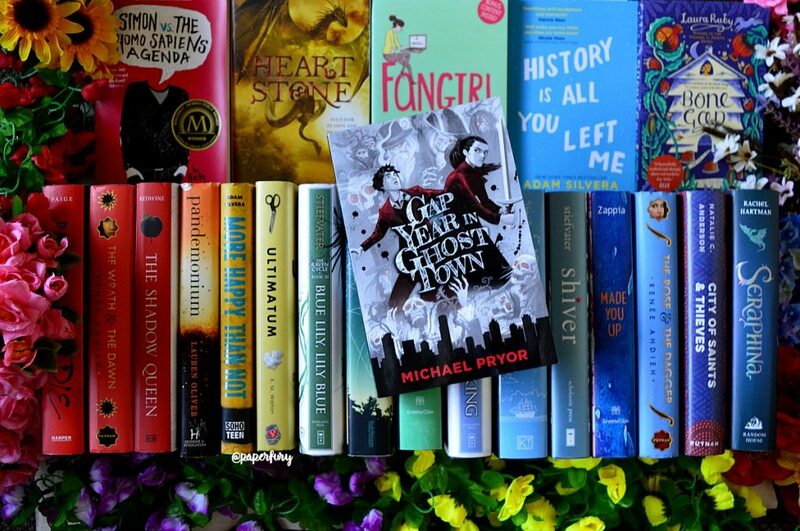 I need all the ghost books in my life. omg this sounds hilarious!! I love books that make me snort and spit coffee across the room. It’s great, also it gets me some *fabuous* looks from people. It’s priceless. That target audience makes absolute no sense at all? Like, at least in my experience, WHAT 12 YEAR OLD DRINKS COFFEE??? No 12 year old, I say. Haha, well I mean, the target audience I assume is supposed to be upper teens finishing highschool? But I personally felt it had a more 12+ year old tone. That was my thinking though! Wouldn’t be everyone’s! sass. sass. sass. This sounds for sure like something I would enjoy. 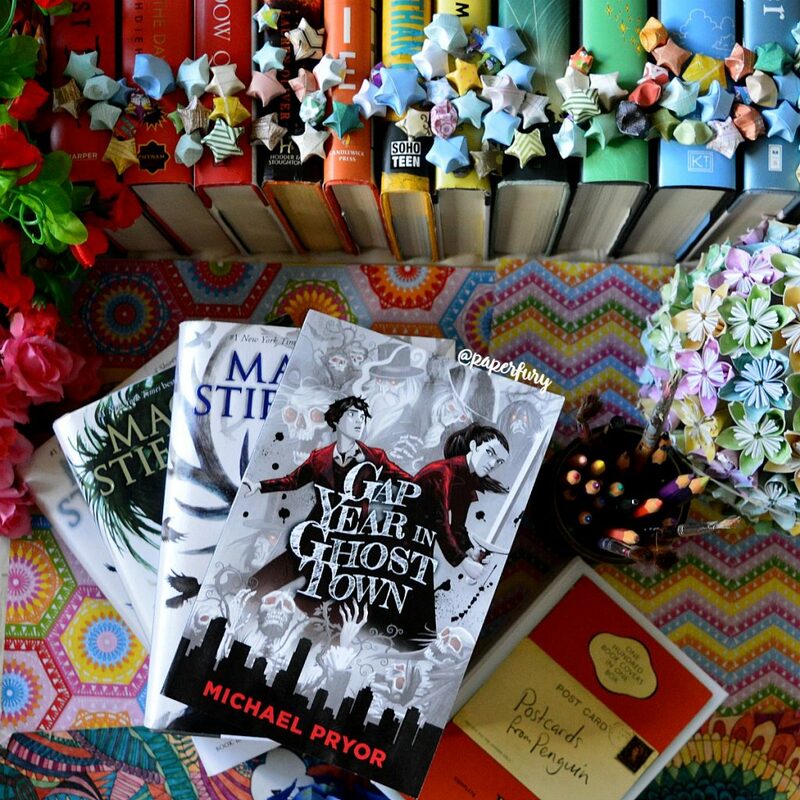 When trying to think of an hilarious narrator, the first book that popped into my mind was “The Year of Yes” by Shonda Rhimes, which was non-fiction, but super hilarious and fed my soul…. But yes, ghost books, and I mean not the scary ones, are just so cool. There should be more… I think I should check this one out. Also, I shouldn’t have googled Tim Tams. Now I am sad they don’t sell those here. And those quotes are super cute. The book one? So much YES. This sounds fairly great. Bumping this up on my to buy list haha. Ahoy there matey. Thanks fer letting me know about this one. I be excited. Of course who knows when in the world I will have time to read it. But I will! Oooh, this sounds pretty good, Cait! I’ll definitely have to keep an eye out for it. Anton sounds awesome! I don’t mind dark/tortured heroes, but I like the hilarious ones, too. I think there’s been a bit too much sass recently, though. It’s still funny, but I’m getting a bit tired of it. I’d like to see characters show their humour in other ways now. I actually can’t think of any hilarious narrators right now, own books themselves that are funny due to awkward situations or whatever. I’ll have to have a think. Awww, I’m sad you’re tired of the sass, but I understand! It doesn’t work for everyone!😂 This is like totally my style of humour though, so as long as it’s quick-witted and self-depreciating, I AM SO THERE. This sounds like just the kind of book I have been looking for. This one sounds interesting. Swords definitely interest me. That sounds weird, but it would be so cool to use swords. Also I love that it is set in Melbourne because I have family that live there and was I only there a month or so ago. Definitely think this one goes onto my TBR list. Great review. Although I love watching shows like Supernatural, I never really thought about reading a book of that style because they just don’t seem so attractive to me. However, your review of Gap Year in Ghost Town kinda made me really want to read it! I think I would enjoy the humor–and the refreshing lack of romance! *hurries to Goodreads to add to TBR* Sounds like the sort of thing I may well enjoy reading (and have enjoyed writing)! Dark matter handled with humor? Charming, chatty narrators? Ghosts and swoooooords? I’m here for all of it! Plus I really liked all the comp titles you listed at the end, so there you are. Yayyy I’m so glad it caught your attention! SO MUCH GHOSTLY APPRECIATION.